At Orlando International Airport we offer more flights to more places than any other airport in Florida, in fact Orlando International Airport provides non-stop service to more major U.S. destinations than most other cities in the U.S.
With more than 880 flights per day, on over 35 airlines, Orlando International Airport is so easy to get to, that’s why more than 129,000 passengers use our award-winning airport everyday. Orlando is the perfect choice for domestic travel or international connections. 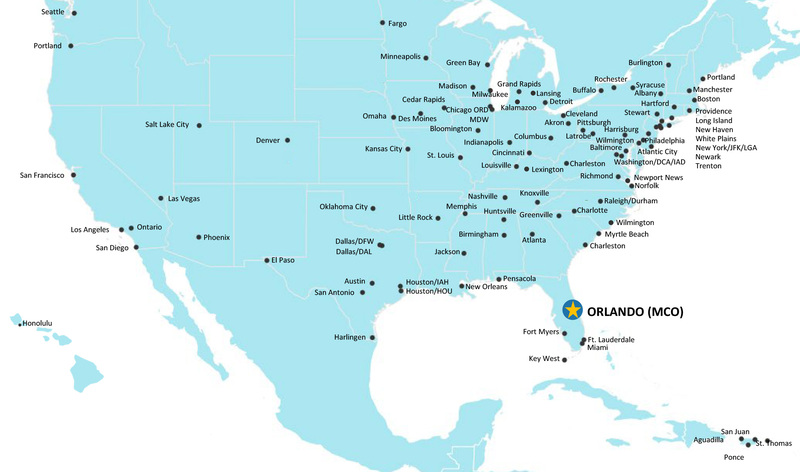 Whether traveling within the U.S. or around the world, heading for Orlando or just connecting through our airport, Orlando’s superior domestic route network gives you more service to more destinations, making your journey quicker and more convenient.